1889 After the death of Henry Clarke, founder of Cogent Cycle Co, the Executors continued that business. Clarke's sons had different views about the direction of the business and went on to set up their own businesses. Four of them, George, William, Jack and Henry, eventually formed a new company, the Wearwell Cycle Co, in premises at 46 Darlington Street, Wolverhampton, close to Cogent's works. 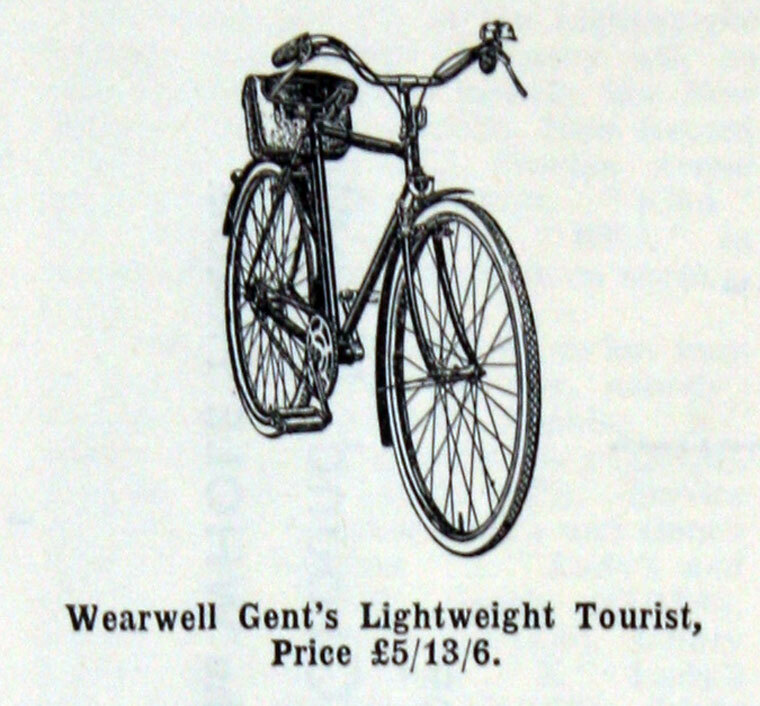 William Clarke became Managing Director of the new company, which soon became one of the most important cycle manufacturers in the town. 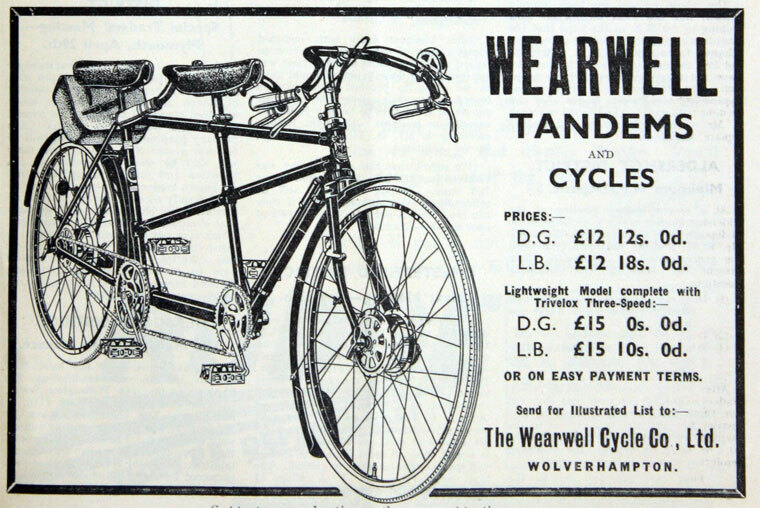 1893 Wearwell listed 9 models, including a cross-frame safety bicycle, and a tricycle. 1899 William Clarke had the idea of producing powered vehicles. He formed the Wearwell Motor Carriage Co, and opened new premises in Pountney Street. By 1905 the company was displaying about 15 models including a gentleman's roadster machine, a ladies version, a path-racing machine weighing 19 pounds, and a road racer which weighed 21.5 pounds. By 1908 about 500 machines were produced each week, many of which were exported. 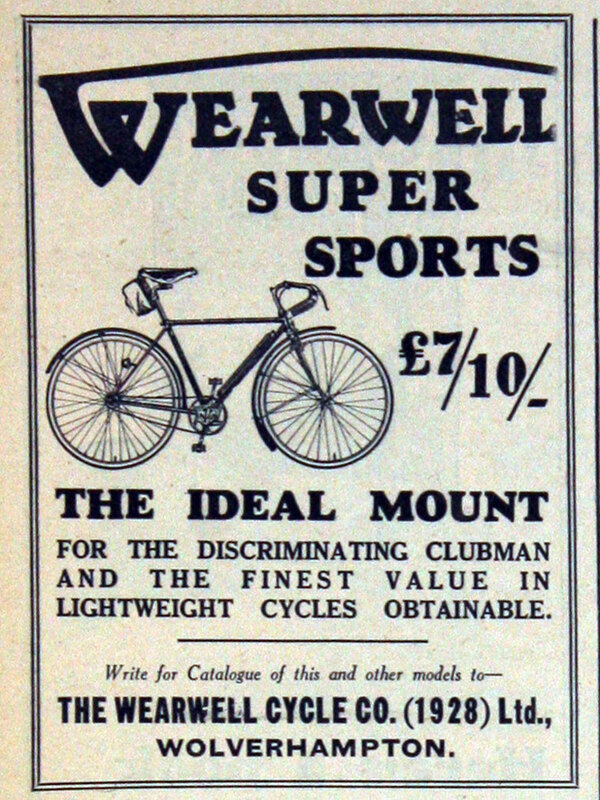 Wearwell designed a roller skate with rubber shock absorbers; about 500 pairs a week were sold. 1910 Company winding up order. 1928 Theo Waine and his brother Mr. G. A. Waine took over the Wearwell Cycle Co Ltd. from the liquidators of the Wulfruna Engineering Co Ltd. Their sons, H. V. Waine and T. A. Waine, were issued with one ordinary share each, and were appointed directors. 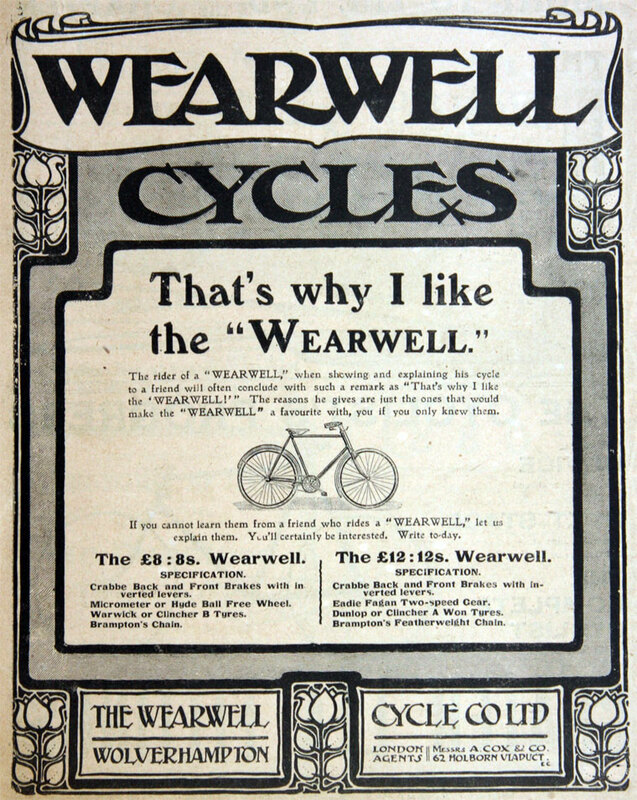 The new company was registered as the Wearwell Cycle Co. (1928) Ltd. 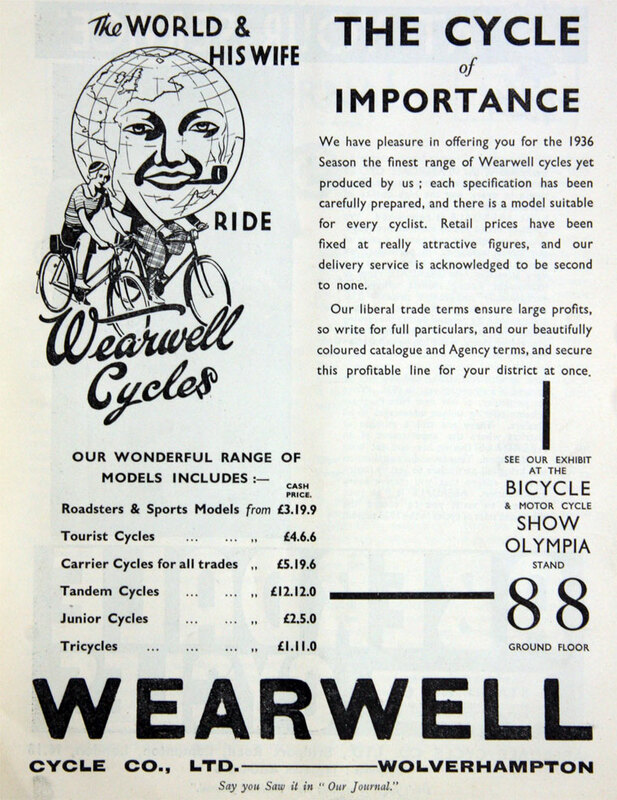 They also purchased the plant, tools and stock-in-trade of the cycle manufacturing side of the Vulcan Manufacturing Co. (Wolverhampton) Ltd.
1929 A full range of cycles was offered including tradesmen's cycles, juvenile cycles, scooters, and the distinctive 'Duplex'. 1931 Showed new 'Schneider' sports machine at Olympia, and a cheaper version called the 'Wanderer'. 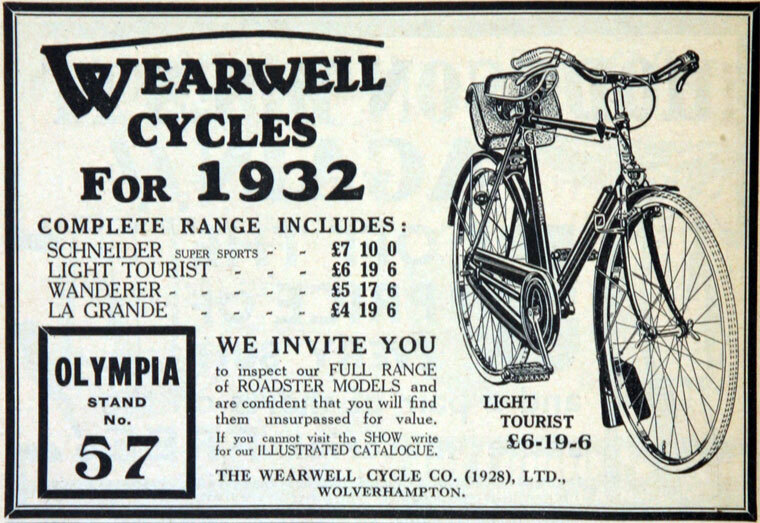 1933 Reverted to the title of the Wearwell Cycle Co. Ltd.
WWII Motor cycle production ceased during the war. The factory was partly destroyed by fire during an air raid but some production was soon restored. .
Post WWII Production of cycles continued and motorcycle production resumed. 1950s 75% of the company's production was exported to over 30 different countries. The company cycle team won the Tour of Britain cycle race in 1953. Established a toy department which made childrens tricycles, swings and other items. 1969 the Vulcan Manufacturing Company went into voluntary liquidation; the goodwill was sold to Tippers, who were in the same line of business. 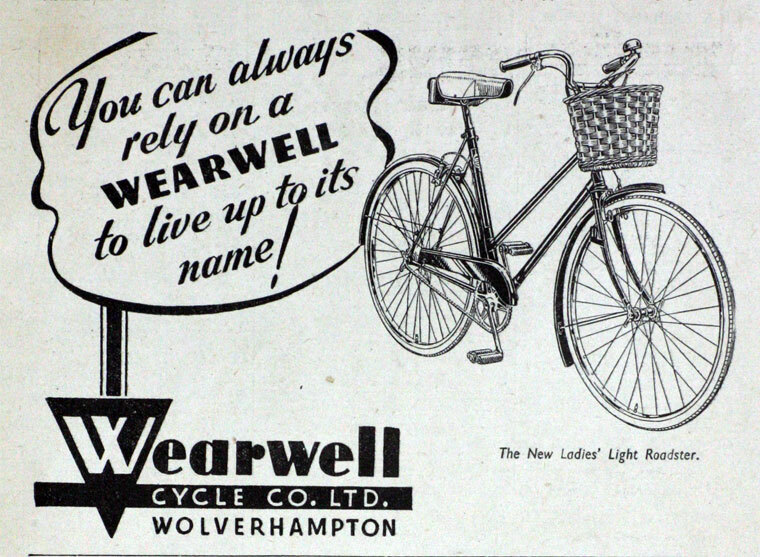 1972 the Wearwell company was also sold and moved its production to Alveley, near Bridgnorth, which marked the end of major bicycle manufacture in the city of Wolverhampton. Later Elswick-Hopper Cycle Co bought the company; production was moved to Brigg in Humberside but sales declined due to the recession and the company closed. This page was last edited on 16 October 2015, at 05:57.